My Experience With Cooking: Unnakkayi-A Malabar Moplah Speciality!! You are here: Home > Snacks > Unnakkayi-A Malabar Moplah Speciality!! Unnakkayi is an authentic sweet dish of traditional Malabar(northern part of Kerala,India) Moplah cuisine. As explained in my Mutton Biriyani post, the Malayalam speaking Muslims of northern part of Kerala are known as Moplahs. To read more about their origin and culture check out this post. I was introduced to Unnakkayi through my mom's best friend who hails from Malabar region of Kerala. Though I have asked my mom on innumerable occasions for the recipe, I never noted it down and conveniently forgot all about it until I came across the same recipe in Malabar Muslim Cookery by Ummi Abdulla. The literal meaning of Unnakkayi is Cotton Buds(Unna-Cotton, Kayi-Buds/Pods) and this delicious snack is called so because it resembles the cotton pods before its cracked open to yank out the cotton. This is a snack used to break the fast during the holy month of Ramadan,the ninth month of the Islamic calender. It was during this month in 610 AD when prophet Muhammad received revelations from God that later became Quran,the holy book. The holy season begins with the sighting of crescent moon on the evening following the new moon and lasts for about 30 days. Muslims must see the new moon before beginning their fast. From dawn to dusk they abstain from food, drink and all sensual pleasures. But two main meals are taken, one called Souhoor that begins each day before dawn and the other, called Iftar that breaks the fast after sunset. Sweets form an important part of the Ramadan food.Unnakkayi is a snack made with steamed, mashed & filled plantains which is later deep fried to a golden brown colour. Traditionally ghee is used to deep fry the stuffed plantains. The filling is made with eggs, grated coconut, sugar, cashews, raisins and cardamom powder. For those who do not prefer eggs, may make the filling by adding more grated coconut instead. Also over ripe plantains should not be used in this preparation as it would make it too messy. Go for the three fourth ripe ones. Cut the plantain into quarters and cook in a microwave for 4 minutes till the skin separates from the fruit. Allow it to cool slightly. Remove the skin and slice each piece lengthwise to remove the seeds. Mash the plantain to a smooth dough using a masher without adding water. The dough should be free from lumps. Slightly knead the dough for a minute or so. Shape it into a smooth round ball. Keep aside covered. Add 2 tsp sugar to egg and beat well. Heat 1 tsp ghee in a pan and scramble eggs. Remove from heat. Add 1.5 tsp sugar to grated coconut, mix well and saute this mixture in the same pan at low-medium heat till the sugar dissolves and coats the coconut mixture. Remove from heat. Add little ghee to the same pan and roast cashews and raisins. Remove from heat. Mix scrambled eggs, coconut mixture, cashews, raisins and cardamom powder. Divide the plantain dough into 4 balls. Grease your hands with ghee, flatten one ball on your palm by pressing with your fingers into a small disc. Place a portion of the filling in the middle lengthwise, bring the edges together and press slightly to seal it. Over stuffing the dough may make it difficult to seal. Now roll it between your hands and shape it like cotton buds, with bulge in the middle and tapered at the edges. Repeat the process for the remaining balls. Heat oil in a pan and deep fry to golden brown colour. Drain excess oil on paper towels. Enjoy hot Unnakayi with tea/coffee and have a pleasant evening! 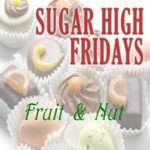 This goes to Sugar High Fridays-Fruit & Nut hosted by Mansi of Fun & Food Blog. Thanks Shabs :) Great that we posted at the same time! Got to know more info from yours too :) I too love this esp to have with hot tea in the evening! Thanks Gita :) Do give a try! Its easy to make n delicious too! Pooja, I had no clue about it, till I finish reading your post! Sounds like an excellent- traditional recipe. Wow.. Still can believe desserts are made with plantains?.. that is surelly Yummo! I have not heard of this treat before but I would certainly like to try it. Your photos are most tempting! Thanks Lisa :) This is relatively unknown outside the state but a favourite snack during all occasions in the region! Wat a delightful dish, never heard about it, quite a delicious and interesting dish Pooja,, thanks for sharing! Thanks Priya :) Do give a try. Its quick n easy to make! Oh. My. God. That looks dangerously good. I don't think I can wait for Ramadan for this though - might have to make it sooner! Thanks Muneeba :) Oh you make any time dear :D This is had during important occasions too! oh my I'm drooling over. Pooja, as beautiful and interesting as your dishes are you have finally made something that makes sense to me - this one I can make with out a translator....not that I didnt understand your english its that I didnt understand the ingredients - thanks! Thanks a lot DB :) Really appreciate the time you have spent in going thru my recipes though you didnt understand the ingredients! Will make sure that I'll write up the ingredients in a way you'll understand. Interesting info pooja, this sweet looks soo good, very diff and unique, loved it!! hey pooja this dish is new to me ! thanx for the recipe.. they look so tempting drool.. first looking it i thought u had prepared the filling and stuffed into the plantain.. dint realize u had mashed it ! great recipe .. must have been very tasty ! Thanks Parita :) Give a try some time. You would love the taste! Thanks Pavithra :) Sure would love to hear your verdict! Looks just perfectly done and yummy. Thanks Uma :) You would like it! Pooja. you have given all the information so nicely....and the dessert looks heavenly delicious and mouth melting...very nice recipe. This looks scrumptious! I would love to try this recipe! This is compltely new to me...looks yummy.. Wonderful dish with plantain.Love the stuffing and deep fry idea.Bookmarked. Wow the sweet looks yummy and so tempting.I never heard this.Even though i never heard abt this but urs dih makes me tempting.It looks very soft like gulabjamun. Wow-though I'm not from Kerala,I've always loved the traditional dishes that are from there! I've actually never tried this one-now I have one more thing I will HAVE to try! Thanks Sweta :) Do try some time. You would like it! Very interesting dish.Hope i can try it one of these days. Interesting recipe...will try out for sure ! Unique outstanding recipe dear. You meant 'raw green plantain' 3/4 ripe,...thats used as a vegetable? Or can I use 3/4 ripe bananas, instead. I know, its silly but...please clarify...coz' I can't find 'raw plantain vegetable here'!!! Thanks Ida :) Give a try some time! Thanks Yasmeen :) I'm not a plantain fan either. But few dishes like this has won me over! Thanks Ashwini :) Do give it a try some time! Wow, I've never seen anything quite like it. Looks super uber delicious! Wish we could find plantains here. Wow nice color and very interesting. It's very new to me yummy recipe will try this.